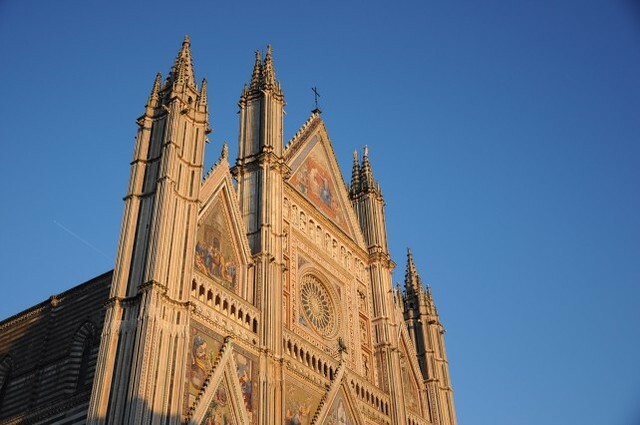 Orvieto is one of the most popular day trips from Rome, and not without good reason. Easily reached from the capital city by car or train in little over an hour, and directly off the main highway A1 almost exactly midway between Rome and Florence, Orvieto is perfect for either a day trip for travelers visiting Rome who want a little taste of an Italian hill-town, or for those looking for that perfect stop-over to break up the trip between two of Italy’s most famous cities. Even if Orvieto weren’t so perfectly situated geographically, the tufo town perched dramatically on top of a steep cliff would be worth a visit. 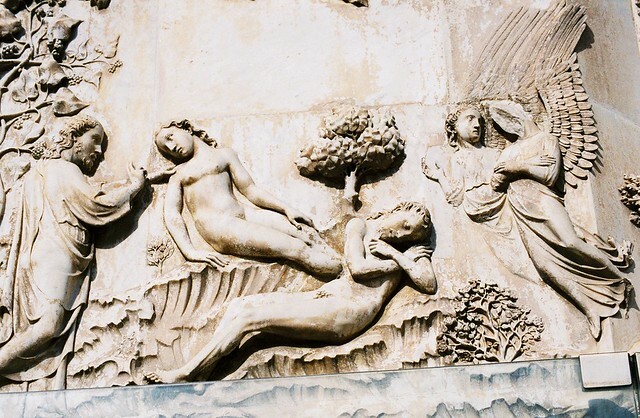 Dominated by one of the most breathtaking churches in all of Italy, and peppered with wonderful shops and restaurants, Orvieto is the perfect size for a day trip of equal parts art, leisure, and food. 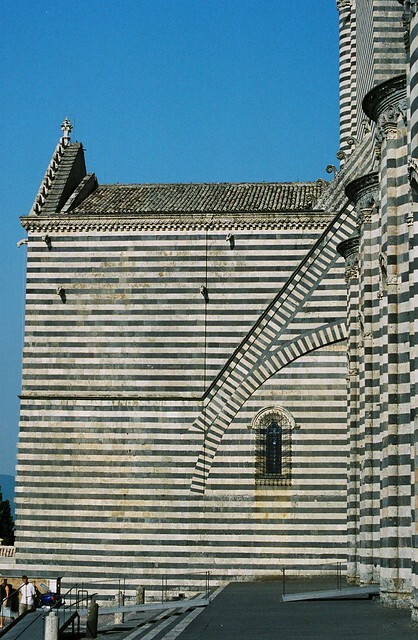 Tweetable: Orvieto is the perfect day trip from Rome or stop-over between the capital city and Florence. Orvieto is an incredibly walkable town, both for its small size and the concentration of its historic center. In a region (Umbria) of steep hilltowns, Orvieto sits more or less level at the top of its tufo cliff and many of its main streets are limited or closed to traffic. Orvieto’s Duomo, Santa Maria Assunta, will stop you in your tracks. The soaring Gothic facade dating from the 1300s is a masterpiece of stonework, statuary, bas-relief, and mosaic and considered one of the finest in all of Italy. Try to see it during the magical hour of sunset, when the golden light sets the mosaics glittering and the tolling bells call in flocks of swooping starlings to roost for the night. Though you may be tempted to spend your time in Piazza del Duomo gazing at the monumental rose window, be sure to take a peek inside the cathedral, as well. Here, in the San Brizio Chapel, are Signorelli’s six chilling apocalyptic fresco scenes painted between 1499 and 1502 and considered a precursor to Michelangelo’s “Last Judgement” in the Sistine Chapel. Stately Orvieto dominates the surrounding hills from atop a dramatic volcanic stone plug it has inhabited since the time of the Etruscans. To understand Orvieto and its millenia-long history, you need to head underground to visit its caves—more than 1,200 of which honeycomb the cliff below the historic center. From the very first underground tunnelings by the Etruscans in search of water roughly seven centuries before Christ, through the Middle Ages when these caverns housed anything from ceramic workshops to dove cotes, to their latest use as a World War II bomb shelter, this vast warren (visited with guided tours leaving from the Tourist Information Office in Piazza del Duomo) is a fascinating walk through history. One of Orvieto’s most famous sights is the Medieval San Patrizio well, which has a double-helix shaped staircase designed by Sangallo and used by men and mules to bring up water during times of siege (feared by Pope Clement VII, but which never came to pass). 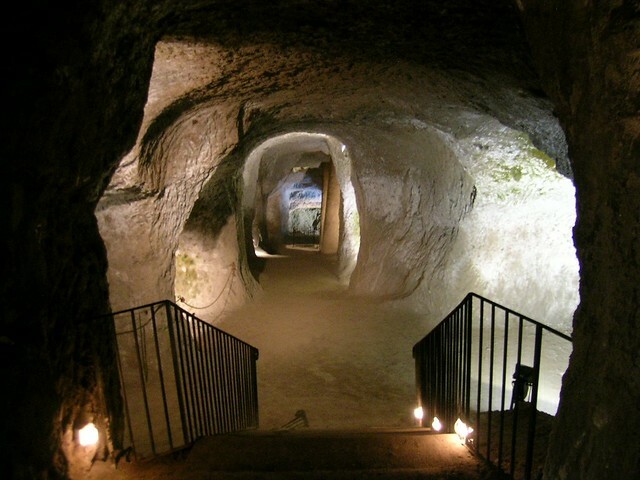 Perhaps more interesting, however, is Pozzo della Cava located in the center of Orvieto. Both older and more actively used, this gives a much more complete idea of the function and importance of wells in Orvieto’s long history. Tweetable: A day trip of equal parts art, leisure, and food? Orvieto, just over an hour outside Rome! It takes just a few minutes of wandering Orvieto’s pretty streets to start noticing the quirky, folk-art wooden sculptures scattered on the streets and in the shops. These unique pieces are the work of the historic Bottega Michelangeli wood atelier. Begun as a furniture-maker in 1789, this workshop—now housed in a former theater on the corner of Orvieto’s main Corso and Via Gualverio--developed its characteristic two-dimensional look under Gualverio Michelangeli in the mid-20th century. The tradition is carried on in the work of his three daughters, who make hand-finished furniture, exquisite toys, and sculpture. Orvieto has a rich tradition of lace-making, beginning with the Ars Wetana ladies’ organization at the beginning of the 20th century, which promoted the production and sale of handmade lace as a means for local women to gain a bit of economic independence. The most common decorative flora and fauna motifs are inspired by the bas-reliefs on the Duomo’s facade, which are imitated even in the unique three-dimensional technique of this local lace. Lovisa Loretta’s tiny shop www.merlettodiorvieto.it/?lang=en‎ on Via della Cava is one of the few places where you can still purchase exquisite handmade centerpieces, favors, fans, and other works. Even if you’re not in the market for gold, it’s hard not to pause and admire the intricate pieces at Orogami on Via del Duomo. The delicate yellow and white gold pendants, earrings, and rings—many inlaid with precious and semi-precious stones—are often linked to Orvieto, itself. Inspired by Gothic architecture (they are only a few blocks away from the Duomo, after all), Roman and Etruscan archeological finds, and nature (seeds, spheres, and stars), their collections are both unique and invocative of this town and its history. One of Italy’s most famous celebrity chefs, Gianfranco Vissani, opened a new combination restaurant-pizzeria-pastry shop-bar on Via del Duomo just a few months ago, which takes the famous Vissani style of fresh, simple ingredients and pares it down to a more casual dining atmosphere than his famed Michelin starred Casa Vissani in the countryside outside of Orvieto. The rustic chic dining room and excellent local fare make for a winning combination. For wine connoisseurs, the Palazzo del Gusto, housed in the former convent of San Giovanni at the highest point above Orvieto (one of the few climbs in this more or less level town), won’t disappoint. Downstairs in the restored cellars underneath the convent, you can take a guided tour--with Graziella, Lucia, or Francesca, walking local wine and food encyclopedias--of the regional wine collection, with more than 120 different labels of the best DOCG, DOC, and IGT wines in Umbria. 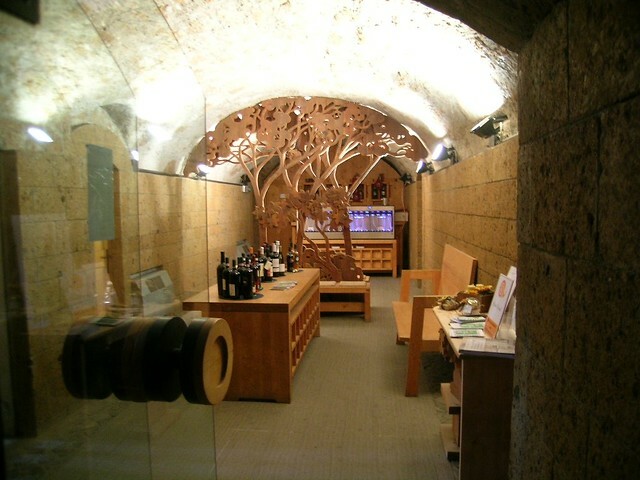 Different packages are available for wine tastings, or you can purchase a prepaid “wine card” to sample up to 16 different wines from automatic dispensers. Though there are a number of excellent bars and café’s lining the main street, for sheer tradition stop in at bustling Café Montanucci on Corso Cavour. The staff is often, um, gruff, but the pastries and cakes are excellent, as is the house chocolate. Make sure to admire the decor, made entirely by local wood atelier Bottega Michelangeli. Tweetable: Italy’s celebrity chef Vissani has just opened a new, casual trattoria/pizzeria/pasticceria in the center of Orvieto.